In efforts to manage the increasing numbers of inmates with mental illness, Cook County Sheriff Tom Dart converted the former Boot Camp facility on the jail grounds into a Mental Health Transition Center. It's considered the only one of its kind in the country, where mentally ill inmates, often low-level offenders, can receive therapy and job readiness training. Today, the population of the Cook County Jail is more than 9,000 inmates. Of them, 31 percent self-identify as mentally ill.
Cook County Sheriff Tom Dart, who has frequently drawn attention to the problem, now says he's working to fix it. He started a Mental Health Transition Center on the grounds of the jail. It began just a couple of months ago, and so far 34 inmates have used the program. 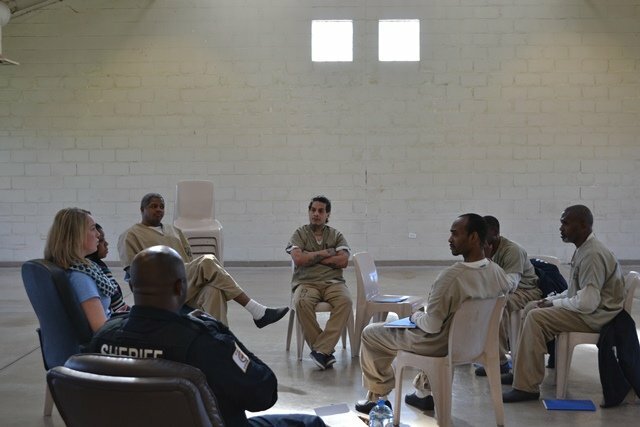 For the first six weeks, inmates receive therapy five days a week for two-and-a-half hours, to change their negative thinking and criminal behavior patterns. Then, for the second six weeks, they add in some job readiness training. One participant, Willie, turned 47 years old while in Cook County Jail for a drug delivery charge. The Mental Health Transition Center at the Cook County Jail is still in its infancy, and experts believe the only one of its kind in the country. It's a problem Sheriff Dart has been sounding the alarm on for the past couple of years—a persistent increase in the number of inmates with mental illness. Watch a web extra interview with Officer Holston. Many of these inmates wrestle with mood disorders and addiction. But some jail or prison inmates face bigger challenges, like schizophrenia or bipolar disorder. That's why, Dart says, he developed this transition center. Epperson suspects Dart and his transition center are on the right track to developing interventions for people with mental illness, who end up in the criminal justice system. He said typical interventions only treat the mental illness, but there are other factors that coincide. He said the treatment for both criminal behavior and mental illness can be delivered at the same time in the same places. Cook County Jail inmates here said they’ve already noticed a difference in themselves. Not everyone knows how much longer they'll be in the Cook County jail, but their hope is that when released, they'll have the right tools to avoid coming back.